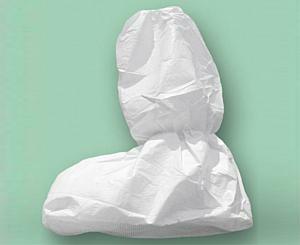 Get the protection of a Tyvek shoecover - for over 30% less! In fact - these non-skid boot covers are 67% more resistant to liquids and 25% more breathable making these an affordable, safe AND comfortable boot cover! They feature a dotted bottom that helps to reduce workplace accidental falls and are latex free and anti-static treated. 67% more liquid resistance than Tyvek!